Hmmm…. Class tomorrow. It’s been a week since I last worked out. Well, more than a week, actually. We didn’t have class last week and I didn’t make it to class Monday. I was having too much fun working on RFPs. (That last part should have been in sarcasm font.) So class tomorrow is going to be really, really rough! Mom spent Thanksgiving week in Kansas City with us. When Mom’s around, we have a lot of food around but we “exercise” a lot to make up for the extra calories. Our family’s favorite exercise is shopping. We’re really good at it, almost professionals, mostly because Mom raised three daughters…in the mall! She’s also introduced our children to this very important exercise method and they’re all rather proficient as well. In previous years we’ve spent Thanksgiving week power shopping, but now we’re down to just normal shopping so I’m sure I didn’t burn as many calories as I normally would have. OK, they WERE on that exact thing! It’s an Apple Bavarian Torte. A delicious layer of cream cheese topped with apples in cinnamon sugar. Anything with apples is healthy, right? And the cream cheese provides a dairy serving; the eggs contribute protein. It’s topped off with chopped walnuts, a heart healthy nut. See? Good stuff! 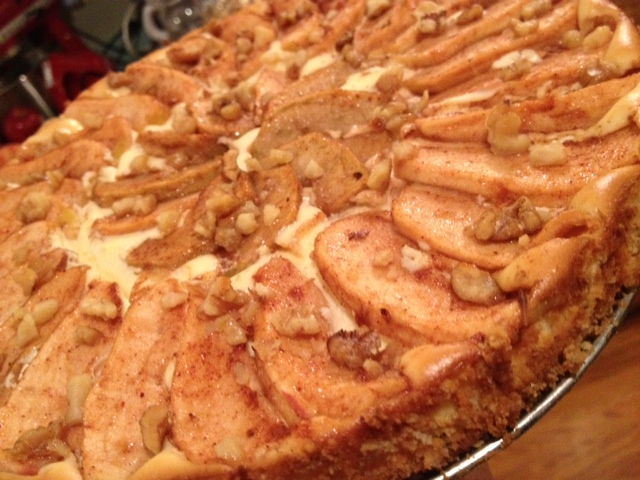 Wish you had your own Apple Bavarian Torte? Hop on over to Munchies Mind and get the recipe. You won’t regret it! I know I’m going to pay for it tomorrow, and class will be tough for me, but it was totally worth it! The torte is gone now. And so is the Pumpkin Pecan Crumble Pie. Now back to real life and “real” healthy food…with a sprinkling of fun stuff here and there, because I do love my sugar!